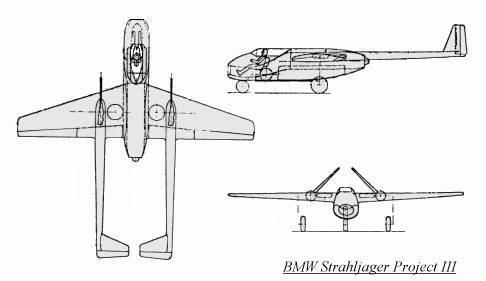 This third design had a shorter fuselage, with the air intake in the nose and ducting under the cockpit to the rear fuselage-mounted BMW 003 turbojet. The wings featured a small amount of sweep on the leading edges; the trailing edges were straight. An interesting feature was the twin tail booms, which had a single fin and rudder at the end of each boom, with the rudder canted innwards. The two MK 103 30mm cannon were mounted in the forward end of the two tail booms.